We offer 2 payment options for the convenience of our customers. Included is a full-featured shopping cart which will permit you to order books online and pay with your credit or debit card or your PayPal account. For those who prefer to use a personal check we continue to maintain an order form which you may fill out and print using the Mail Order Form button below. If you are the kind of reader who likes to turn a few pages before making a purchase, books are now available for sale at the Toy Tree, 14 Church Hill Road, Newtown, CT. They will also continue to be available for sale at The Cyrenius H. Booth Library, 25 Main Street, Newtown, CT. If you prefer you may call, mail or email a request to the Newtown Historical Society using the contact information on the top banner of this page. Please do not click any Add to Cart buttons if you are just using the mail order form. Newtown was founded in 1705 and developed with twin economic engines of agriculture and industry until the 20th century. In this, Newtown is similar to most of Connecticut's inland towns., but a number of unique citizens made the town distinctive with its own culture that is subtly different from all of the surrounding towns. This book focuses on approximately 80 people who have been instrumental in this distinctive economic and cultural development from the earliest part of its three century history to the present. A over a third of these people were responsible for the modern development of the town. Each of the portraits have been grouped into areas of accomplishment from those who founded the towns earliest institutions to the agriculturists who gave the town its rural flavor. It also introduces those who were so important to establishing educational and religious institutions, tending to the residents health needs, supplying jobs and providing the necessities of life that could not be made at home even with the populations fabled Yankee ingenuity. Newtown also became a haven for writers, artists, and performers, especially in the 20th century and many of these contributed to the unique nature of the town. A special section is devoted to these talented people. Another section is devoted to those who talent was manifest in their physical prowess and those who were responsible for developing that prowess. Since every town has its special treasured characters, a final section looks at them. Overall the book looks at the special talents and accomplishments that makes these people legendary. They will be presented in portrait form or in the context in which their legendary nature emerged. In addition, over 45 vintage photos, many published here for the first time, are included to show how the town served as the setting for the development of legendary locals. 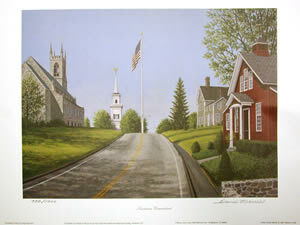 A signed and numbered 14” by 18” print of Newtown artist David Merrill’s painting of Church Hill Road looking toward the flagpole and The Meeting House. David Merrill’s work can be seen in the halls and stairwells of Edmond Town Hall where his murals feature people, places, and events associated with Newtown. The Winter encampment in Redding, was General Israel Putnam's last command. During the winter of 1778-79 he led about three thousand troops of the Continental Army into three separate valleys of northern Redding where they built temporary huts for protection against the winter cold. Here they lived for five to six months before marching out to engage the British for the next fighting season. This is the story of that winter sojourn in the wilds of western Connecticut, and the dramatic effect that this fourfold increase in population had on Redding. For the past 12 years we have been engaged in archaeological excavations in the easternmost of these three encampments. During the course of our work we have been actively searching out any and all documentation about the men of the park and the style of life they led during those months. What we have found is startling and new having application to not only our winter camp but also that at Valley Forge, which was the year before, and at Morristown, the year after. This camp was a true transition as the Revolutionary Army continued to turn itself into a professional army proficient enough to finally defeat the British Army at Yorktown. During that winter there were skirmishes with lawless elements along the border, a near mutiny of a company of restive troops, two executions, and stories of heroism such as Putnam's perilous ride down the 100 steps that separate the two section of the Village of Greenwich. This was also the winter and location in which the Masons reestablished themselves in Redding as a social force in the Continental Army. Central to all of this, however, is the daily life of the underfed, underclothed and underpaid soldier who endured the monotonous daily activities of the off-season. Between the things that they left behind and the documents they generated the most complete picture of a Revolutionary War soldier's daily life that has yet been created is presented here. Arranged in four auto tours and one walking tour, Mary and Al have created a convenient book that enables the reader to make five circuits of town which pass most of Newtown's distinctive pre-1826 houses. The book contains a wealth of detail on early American domestic architecture and on many of the people who built and lived in the town's earliest homes. The text, composed by Mary Mitchell, was scrupulously researched and contains details about the early history of the town than can be found nowhere else. Al Goodrich's maps show the hand of an engineer. They are accurate and provide precise locations for some of Newtown's most stately and humble homes. Printed in two colors, it will enable the reader to easily find his way to the most important examples of early American architecture and, more importantly, find his way back. The text and beautifully printed photographs of all of the tour's houses are supplemented by a facsimile copy of the 1854 School District map of Newtown on the endpapers. This volume in the Arcadia Press' series, Images of America, presents 288 Photographic images of Newtown showing how it looked from 1870, just after the Civil War, up to the Second World War, just before Newtown began to make it's dramatic change to a large suburban town. Its captions give a concise history of some of Newtown's most important landmarks, both those that are still to be seen and visited and many that are no longer in existence. The book also contains a special section on the five railroads that ran through Newtown at the turn of the century and the six depots that served those lines. Another special section is devoted to the War Maneuvers in 1912 during which 10,000 army and militia units descended on Newtown as half of them tried to capture the reservoirs that were vital to New York and the other half tried to stop them. The maneuvers climaxed with pitched battles on Cole's Hill just west of the village and Mount Pleasant. All of the latest technology was being displayed from machine guns to spotting aircraft and Newtown experienced one of the most exciting weeks of its history, and it has been reproduced here for everyone to enjoy again. This volume in the Arcadia Press' series, Images of America, presents more than 200 photographic images with captions telling the story of the transformation of Newtown from an agricultural town with some light industry to an integrated town with a highly mobile population. Pictures and descriptions of Main Street including structures donated by Mary Hawley are followed by images of Sandy Hook, the outlying communities of Palestine, Taunton Lake, Botsford, Huntington, Hattertown, Gray's Plain, Stevenson, Hawleyville and the summer community of Riverside. The section on special events includes celebrations for the 1905 Bicentennial, the 1919 Welcome Home and the 1932 Washington Bicentennial. The story of the 1912 War Maneuvers that culminated in Newtown has been continued in this volume because additional photographs showing troop movements in surrounding towns and a photo album kept by a member of the New York National Guard have come to light since the first Images of America: Newtown was published. Originally created to supply information on the glacial geology and early human inhabitants of the county for his Local History Class at Joel Barlow High School, Dan felt that the information that this text contained would be enjoyed by a wider audience. As a result he revised and rewrote the text to make it reflect the latest discoveries in Connecticut archaeology. Along with his own graphics and photographs, this work tells the story of Newtown from the break up of the supercontinent, Pangaea, up to the coming of the town's first settlers, where all other histories of the town begin. In this short monograph Dan has summarized a year of research on Newtown slave and early free black population. From scattered records he has found data on 71 Afro-Americans who were kept as slaves, their owners, and some of their family history. From this database he has compiled a picture of the life style of these forgotten members of early Newtown Society. To tell this story more fully Dan has also enlarged his data base to include the free black population of the town up to 1860 and this has enabled him to trace what eventually happened to many of the slaves after they were freed. There are no living descendants of Newtown's slaves still in this area and Dan attempts in his last chapter to explain why this is so. Dan has also included an account of those blacks who fought in the American Revolution to help their masters gain freedom from the British crown as well as a special section on black folklore which includes a consideration of the effect on the Underground Railroad on Newtown and an account of what really happened to Purdy of Purdy Station. 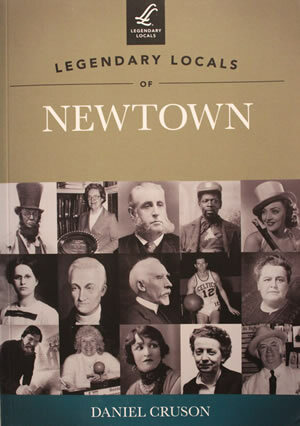 The list of essay titles from A Mosaic of Newtown's History describes the breadth of interesting information to be found in this hardbound volume, illustrated with historical photos and supplemented with a 12-page Index, which will undoubtedly become a valuable tool for countless readers and researchers well into the future. Click on the chapter links below to display more detailed contents. Much labor has been devoted to documenting the Northern response to the South's peculiar institution. While the details of anti-slavery are well known, the other side of history is neglected: the enslavement and subjugation of slaves who lived and toiled in Northern states. In this groundbreaking book on the slaves of Fairfield County, Dan Cruson presents a comprehensive picture of rural slavery in eighteenth- and early nineteenth-century Connecticut. From the framework of everyday life â€“ including the slave-master relationship, housing and dress â€“ to the role of slaves and free blacks in the Revolution that hastened the demise of slavery in Connecticut, Cruson's accessible and intriguing rendering of slave life in central Fairfield County will fascinate and inform readers. Utilizing local slave archaeology, Cruson presents exciting recent discoveries that shed light on African American spiritual practices. He goes on to tackle the complicated issue of anti-slavery activity, discussing the problems with the abolition movement in Fairfield County in the 1830's and 1840's and questioning prevalent local folklore about the Underground Railroad. This meticulously researched book uses a database of over seventy slaves from Newtown, enhanced with information from the neighboring town of Redding. Eleanor Mayer had a career in banking and real estate but along with her brother, she continued to assist her aging father until she assumed the entire management of Cherry Grove Farm. She tells of her grandfather's settling in Newtown; the farming lifestyle; the hired hands who lived with her family; the one-room schoolhouse she attended in 1936; being in the first class to allow girls in the Vocational Agriculture program; working the land; the crops; the exhibits she made for the Danbury Fair; and the challenges of farm ownership in the 21st century. This hard covered, 87-page book includes 9 photographs and an index. This short biographical pamphlet tells about solving the mystery that surrounded the life of Newtown's beloved benefactress. It tells the story of a true Victorian tragedy, a tragedy that Miss Hawley largely overcame only in the last ten years of her life. In addition to telling the story of her life, it gives a brief account of her ancestors after whom the buildings she donated to the town were named. Also included are reproductions of four of the five adult photographs known to exist of this town hero. This biographical pamphlet tells the story of Newtown's most distinguished citizen, the maternal grandfather of the town benefactress, and the man after whom the town hall is named. William Edmond was a hero of the Battle of Ridgefield during the American Revolution, being wounded and left for dead all night on the battlefield. He actually operated upon himself to save his leg from amputation. Edmond went on to become a Representative for Connecticut in the Congress of John Adams at the turn of the 18th century. He also served as a judge of the Connecticut Supreme court until the new state constitution, to which he was opposed on principle, was adopted in 1818 whereupon he retired to Newtown where he gave free legal advice, composed poetry, and continued his study of philosophy, theology, and several other scholarly subjects. A selection of his recently rediscovered poetry has been included so the reader can judge its merit. In this pamphlet Dan tells of a murder that occurred in the southwest corner of town, a fact that was discovered by one of his Local History students in 1984 from her research of local folklore. When she did the initial research, most of the details of the case could not be found. Dan then recounts the 15 year search to find the details of a case that turned out to have many bizarre twists and turns. Andrew Peck who was characterized by the Newtown Bee as "a moral outlaw," was murdered and Rudolf Stoffel, a recent German immigrant and charcoal burner with a short, violent temper, was the murderer, but it took two years before enough evidence could be collected to convict him. An account of the process of collecting this evidence, leads the reader past a cast of strange characters who lived a life that could only have been lived in this frontier area, farthest away from the moral authority of the three towns whose boundaries come together there.